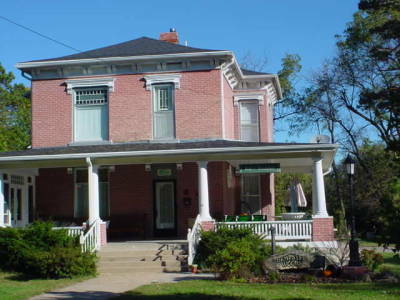 The FILLMORE COUNTY VISITORS COMMITTEE invites you to take a self-guided tour of the featured sights in this brochure. Northern Fillmore County is 15 minutes south of the I-80 York exit. Sights not located in the communities are marked on the map. 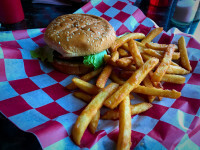 Geneva, which is located on Highway 81, was the logical choice for the Fillmore County seat. When the railroad extended its lines from Lincoln to Hastings in 1871, it proposed naming the towns from Crete westward alphabetically. Taking over where Saline County left off are the Fillmore County villages of Exeter, Fairmont and Grafton. The location of these towns, also along Highway 6, provided them with opportunities for transporting and receiving goods via rail for many years. East of Geneva on Highway 41 is the Fillmore County community of Milligan; to the south is Strang; Ohiowa lies southeast and Shickley southwest, both on Highway 74. 6. St Stephen's Catholic Church, 130 E Seneca, Exeter The first church, a wood frame, was built in 1874. The present Romanesque church building dates from 1902 and has undergone many renovations and restorations, the first occurring in 1918 when a storm damaged the steeple which was not replaced. A complete interior redecoration was done in 1978. Another renovation was completed in 2003, restoring the painting of the altar ceiling. Original to the interior are the altars and the stained glass windows; also original and still in use are "Thomas" and "Paul", the bells in the church tower. 7. Exeter Mural, 231 Exeter Ave., Exeter This representation of downtown Exeter around 1900 and was created by Greg Holdren, an artist from Friend, Nebraska. Adjacent to the mural, which depicts a fire truck en route to a fire, is the historic marker for the founding of Exeter. In 1870 the first house was built in Exeter, named by former residents of Exeter, New Hampshire. The Burlington Railroad aided the community's growth and brought many Easterners, Czechs, Germans, English, Irish, and Scandinavians to the area. Sixteen businesses were in operation by the date of its incorporation, April 1, 1879. In 1896, Charles C. Smith built a factory, which produced index tags and operated for 66 years. 9. 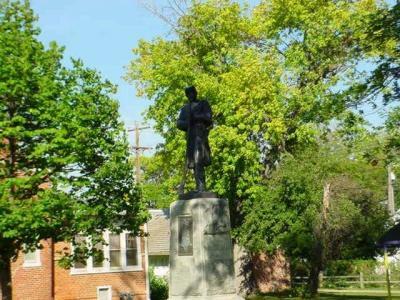 Union Soldier Monument, 612 6th Ave., Fairmont Also in Fairmont, located in the park just south of the Fillmore County Museum, is a union soldier monument, dedicated on June 26, 1910. The monument was restored and rededicated "to all who served" in 2001. 11. St. Helena's Catholic Church, 170 N Jackson, Grafton The original St. Helena's, the first church in the township, was built in 1880. 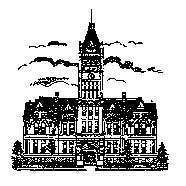 A building fund was begun in 1916. Parishioners' donations and the church ladies' yearly bazaars resulted in $18,000 by 1922 when the original church was sold for $400 and moved to make room for its replacement. Church services were held in the Opera House until September 10, 1923, when the new St. Helena's was ready for worship. At the cost of $250 each, stained glass windows from Italy were added in 1927 and refurbished in 2000. The church's completed cost was $43,325. The ladies bazaar is still an annual event, contributing to the support of the church. 12. Manning Grain Co., 4 Burress Rd., Fairmont Four miles north and five miles east of Geneva is a former Burlington train depot, not the Manning Grain Co. on the site of the little community of Burress, once a trade center of 75 people in the 1920s. The first railroad was built here in 1887. 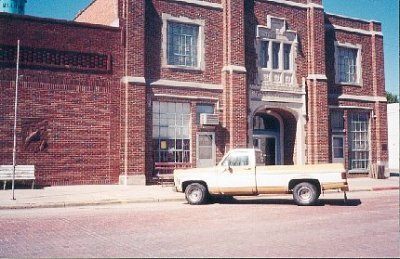 Before the depot's transition into a grain company, it wasn't unusual for over 1,000 people per night to attend dances there, until the bands became too big and the prices too high. 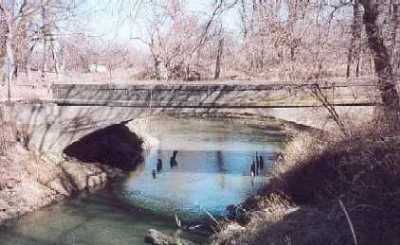 The last dance was held there in 1949 on the Fourth of July. 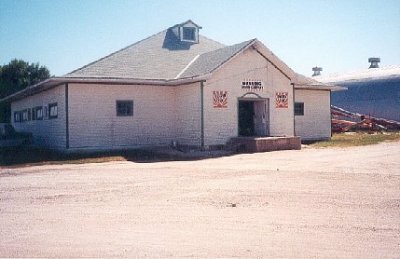 On the following day the Mannings discovered that the former dance hall held over 28,000 bushels of grain. Through the years in addition to providing beer, boots, feed and fertilizer, it has been a gathering place for area farmers. 13. Ceski Bratri Cemetery, Highway 41, west of Milligan The earliest gravestone in the Ceski Bratri Cemetery near Milligan is dated 1876. Other unmarked graves represent earlier burials of travelers from passing wagon trains. Built in 1874 on farmland northwest of the cemetery, the chapel was moved to the cemetery in 1901. 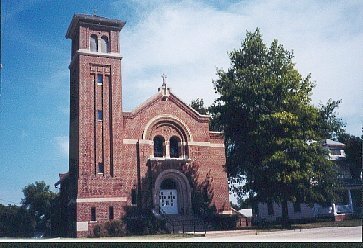 It was the first church for Catholic pioneers in Fillmore County. 15. Strang Museum, Main St., Strang Formerly the Hamilton township hall built in 1889, the Strang Museum was moved to town in 1984. 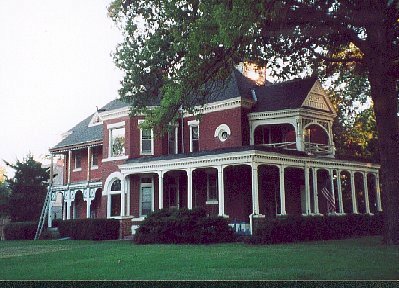 During Strang's centennial year, 1986, the building was transformed into a museum. 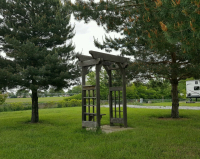 Standing on the grounds is a wooden windmill and the steeple bell from the United Brethren Church. 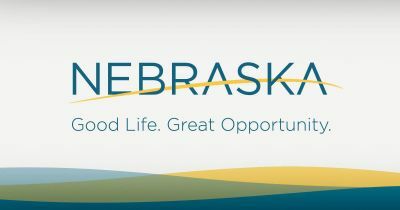 Visitors can make an appointment to see the museum by calling Joy Lentfer, 402-759-3706, or Janet Lentfer, 402-627-2085. 16. 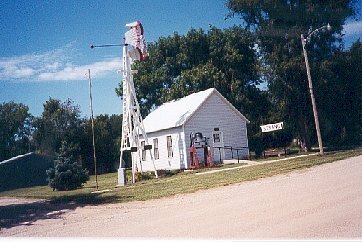 Strang Windmill, Main St., Strang Once called Media before it was incorporated, this village was renamed when it was discovered that another Nebraska town had the same name. A.L. 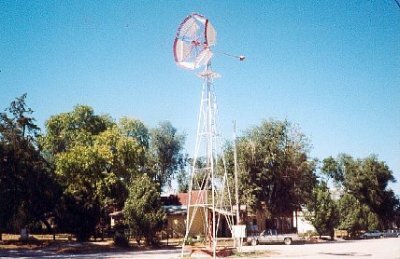 Strang, an Omaha windmill dealer, gave the town its first windmill, which used to run the town pump. A windmill still sits in the middle of the principal intersection on main street. 17. 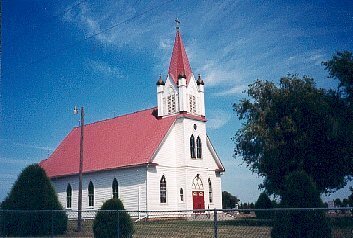 Grace Evangelical Lutheran Church, 3 miles south of the southwest corner of Ohiowa The original Grace Evangelical Lutheran Church was organized on September 25, 1887, as St. John's Lutheran church. 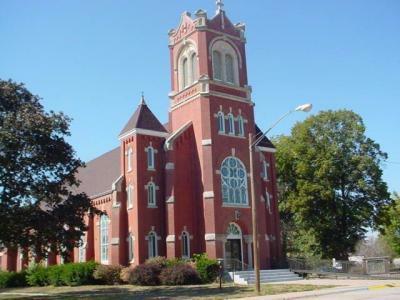 The first church building was constructed in 1888. In 1917 the new church replaced the first one. Some of the early pastors of this church were born in Germany and migrated to America. 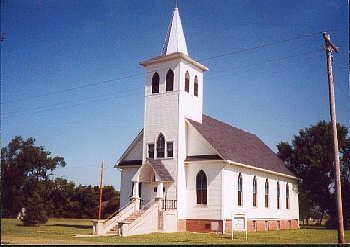 Over the years the church has been known as the South Lutheran Church, and in 1954 its name was changed to Grace Evangelical Lutheran Church. After the original statue on the altar was destroyed in April 1967, the church was restored in September and a new statue from Trinity Lutheran Church in DeWitt, Nebraska, was placed on the altar. 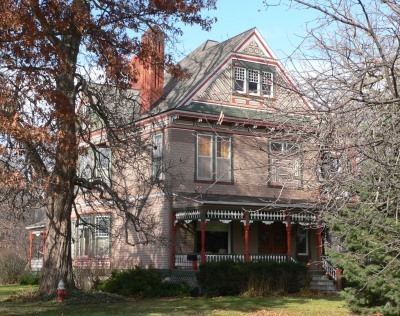 Visitors may see its interior by calling Willard Rippe, 402-295-2579, or Ronald Rippe, 402-295-2542. 18. Franklin Township Building Mural, Main St., Ohiowa In 1978 an Ohiowa graduate and artist, LuAnn Matthies, created the 74-foot mural on the north wall of the former Franklin Township Building in Ohiowa. From the framed silhouettes of deer grazing on the populated plains, the westward bound wagon trains, the horse drawn plow breaking the sod, and the appearance of the tractor, this four-frame progression captures the essence of the land and its changes with the arrival of the homesteaders in Fillmore County. 20. Virgil Biegert Public Library, 214 N Market St., Shickley Chosen as one of the best libraries in the nation was the Virgil Biegert Public Library in Shickley, a community of about 360 residents. 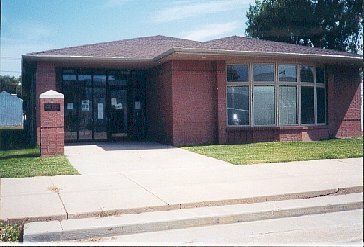 According to an article published in the January 2001 Hastings Tribune, the America Public Library Ratings Index recognized the library based on the size of the community it serves and the amount of use by its patrons. Virgil and Helen Biegert, lon time residents of Shickley, funded its building in 1994. Library hours: Monday and Friday, 9:30-11:3- and 1:30-5:30; Wednesday, 2:30-6:3-; Saturday, 9:30-11:30.